Bananas may not be the summeriest of all fruit, but dipped in chocolate, rolled in crunchy bits, and frozen, they beat any icy treat on a hot summer afternoon. A brief 40 minutes of slicing, melting, and rolling, a bit of freeze time, and a sweet kid-friendly treat awaits. I like it thawed out a bit, so the banana is soft, but others seem to prefer that cool banana center straight from the freezer. In the past, I've whipped these up even faster by leaving the banana whole, dunking it in the chocolate, a quick roll through nuts, and to the freezy bin. Yet when sharing, the bites are soooo much easier to pass around. A great summer sweet-n-salty treat, and a very tasty way to reap some of those seed benefits: Vitimin E is abundant in sunflower seeds, and pumpkin seeds are little green packets of minerals - and great for men's health. It's no wonder banana bites have been dominating the blogosphere this year! 1) Melt chocolate and olive oil on med-low heat until smooth. 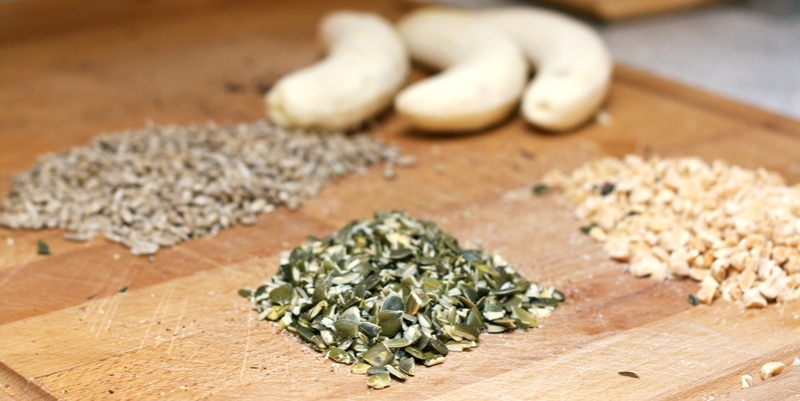 2) Chop nuts and seeds, and slice bananas about 1 cm. 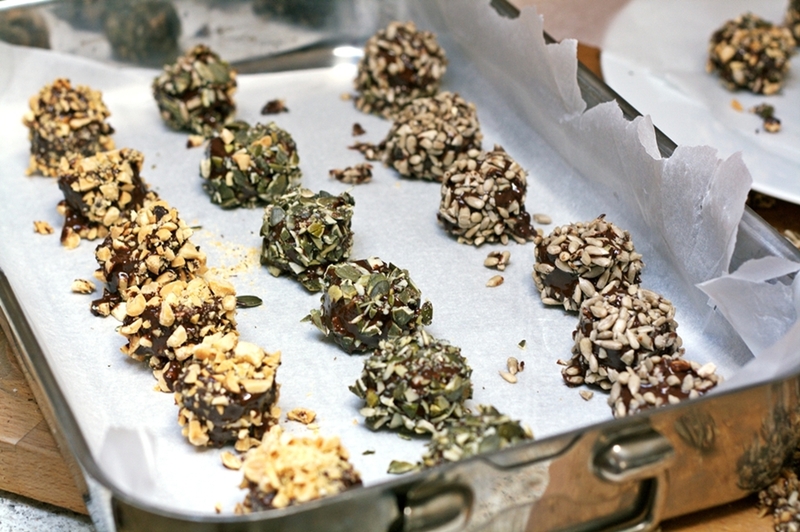 3) When chocolate has cooled for about 10 mins, dip each piece in and roll in nut and/or seeds. 4) Place in a pan lined with wax paper, and freeze at least 1 1/2 hours. Store for a few days in the refridgerator.